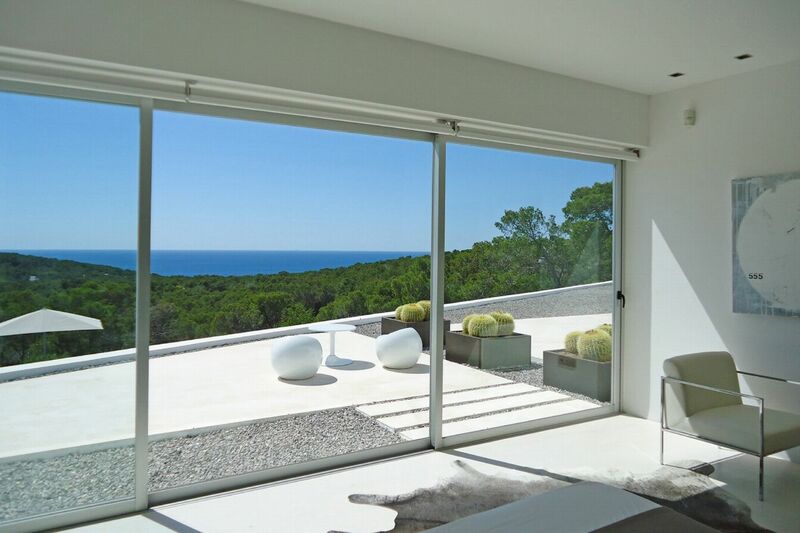 Ultra modern property with amazing sea and sunset views with immaculate outdoor entertaining areas. 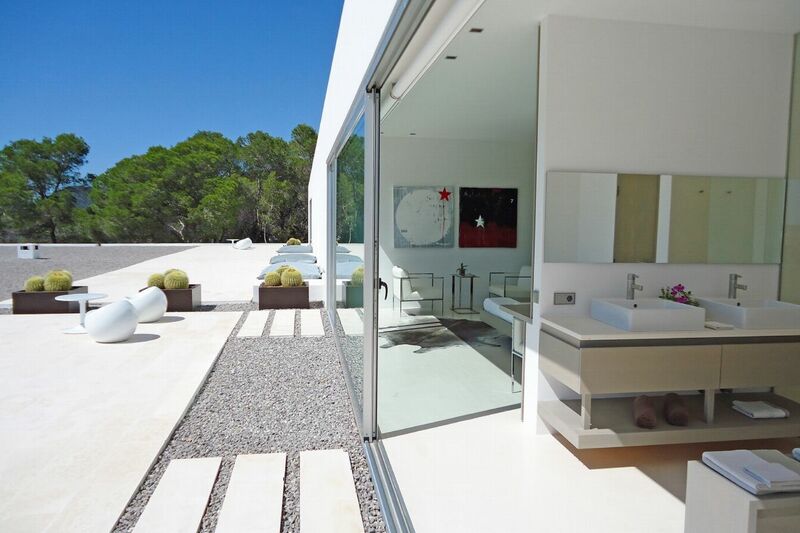 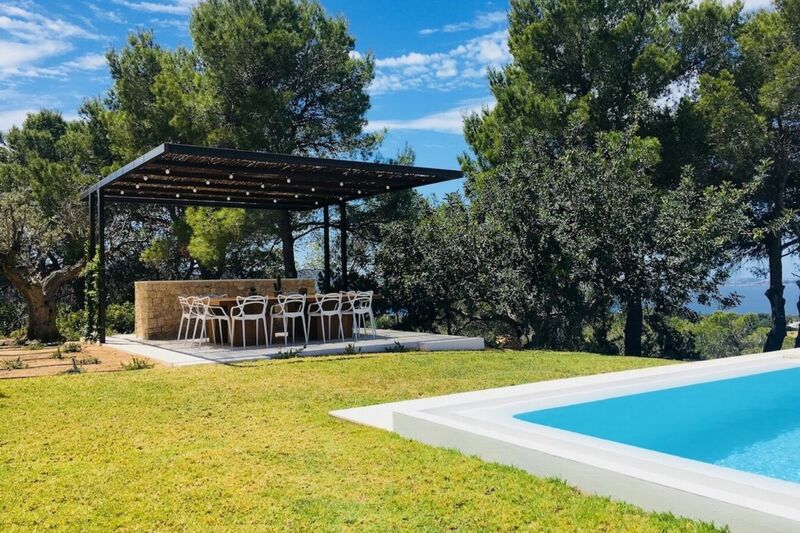 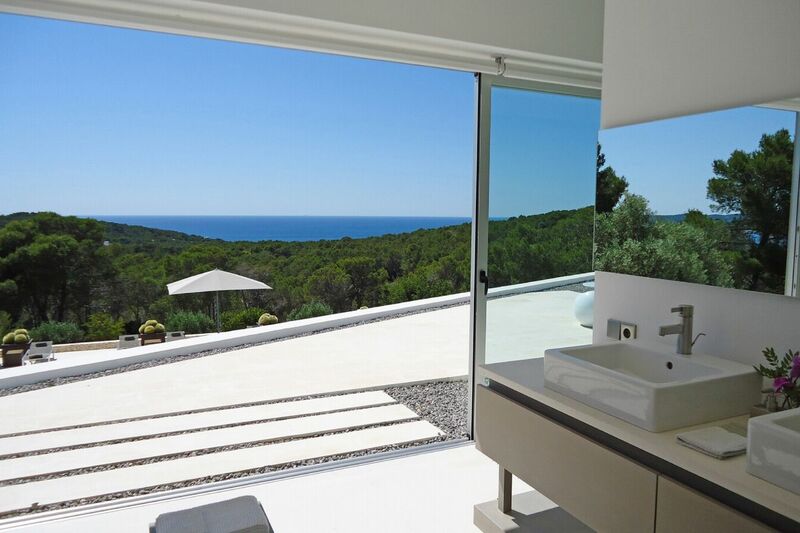 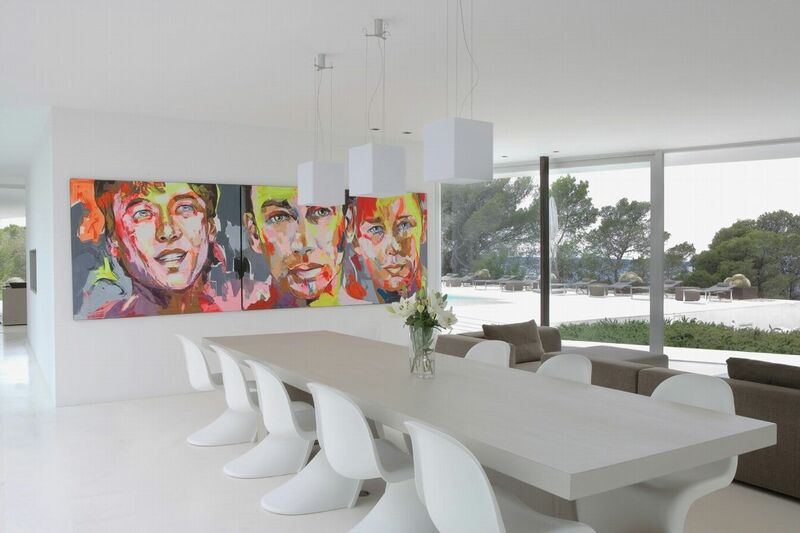 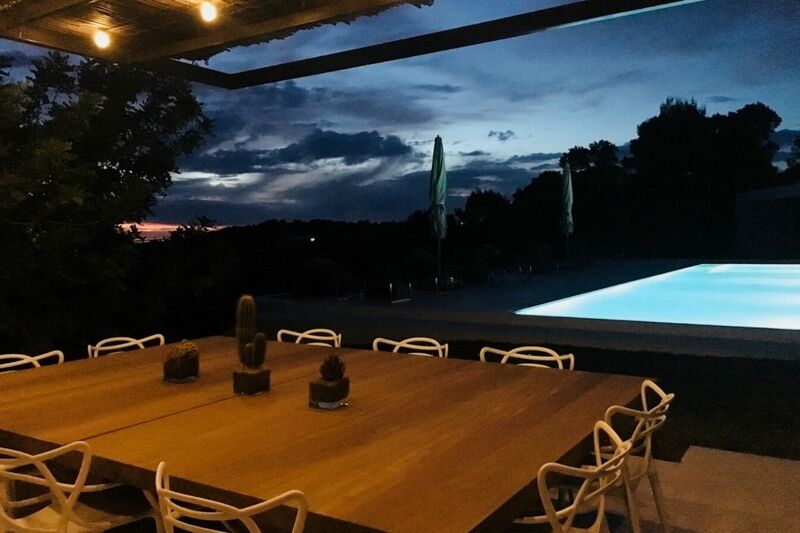 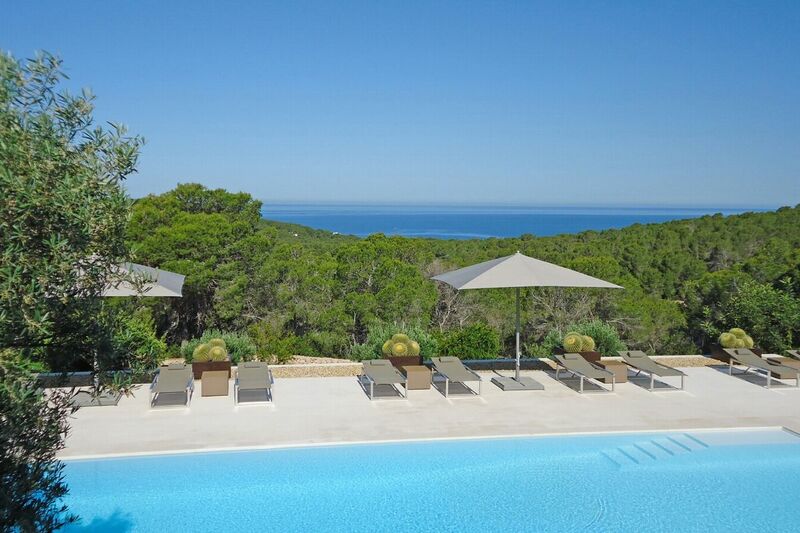 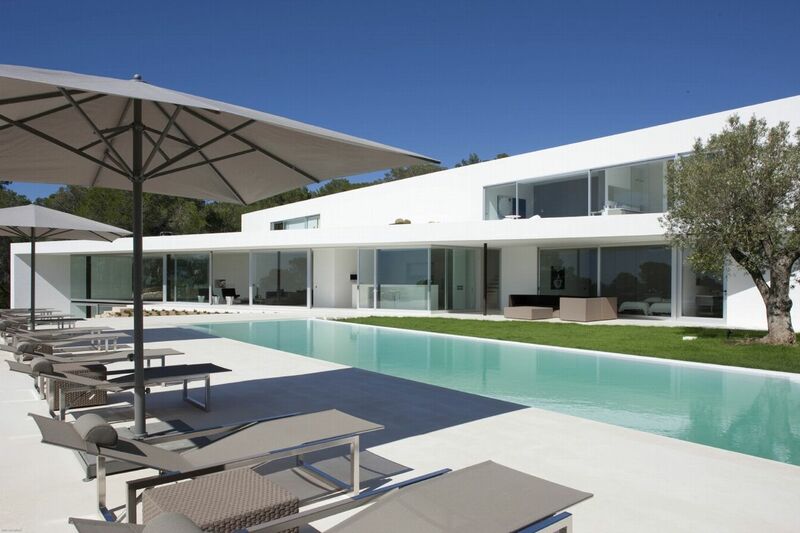 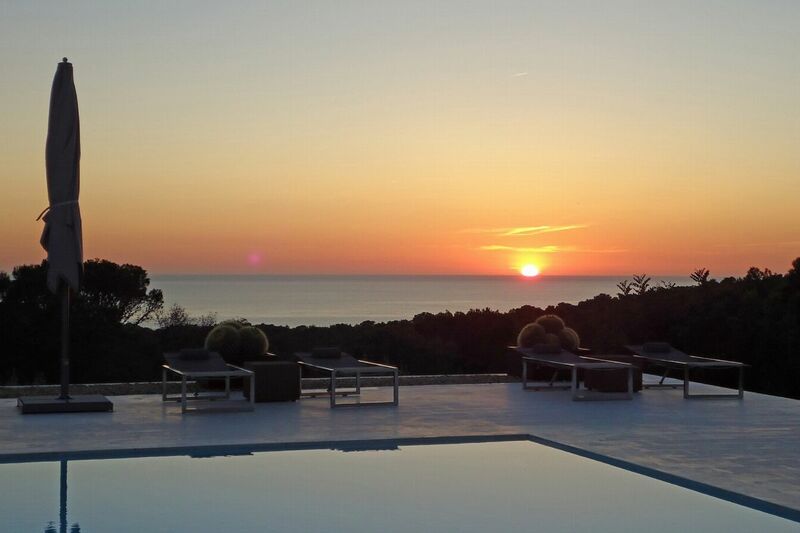 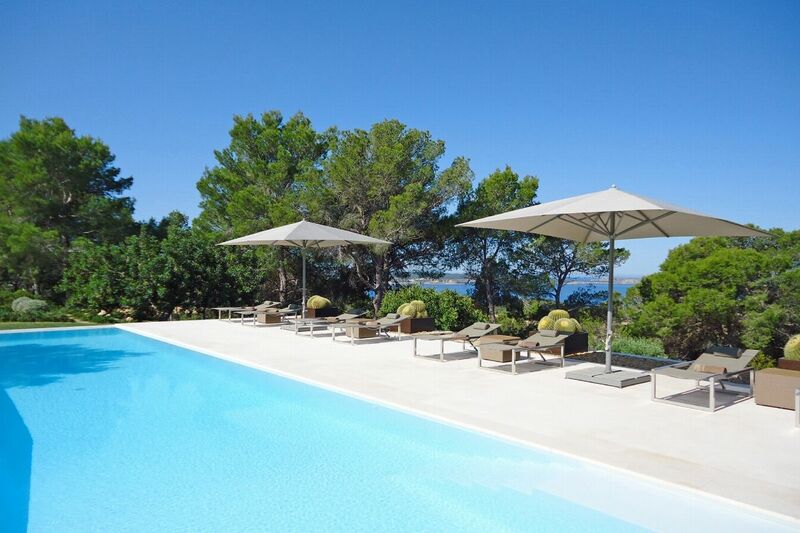 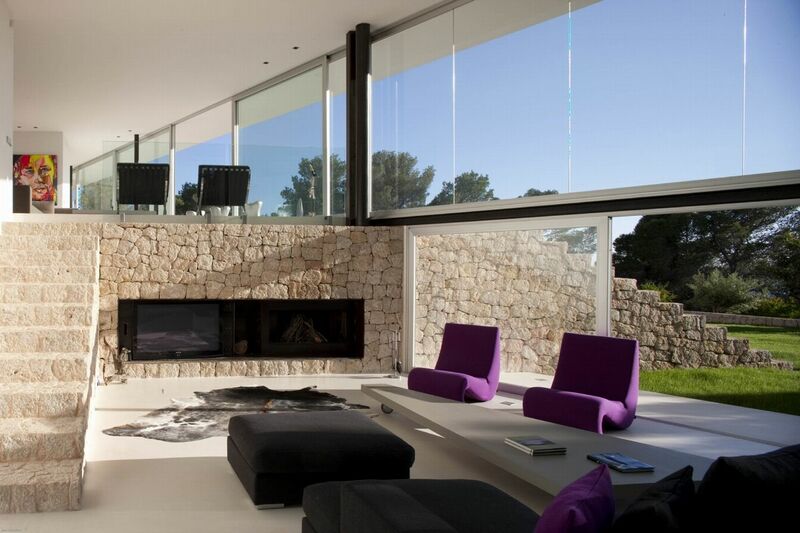 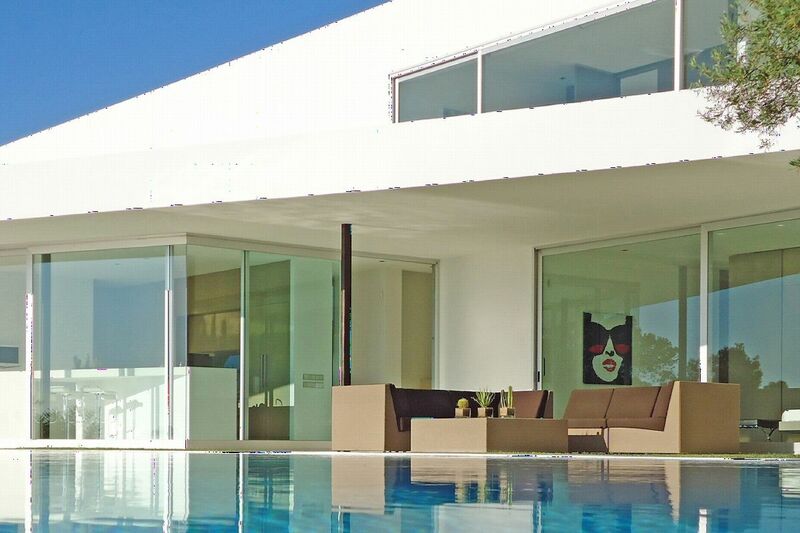 This exceptional modern villa with stunning sea and sunset views, close to the beaches of Punta Galera and Cala Salada is situated in a private 40,000 m2 plot in the middle of 4 acres of pine forest with orange and olive trees. 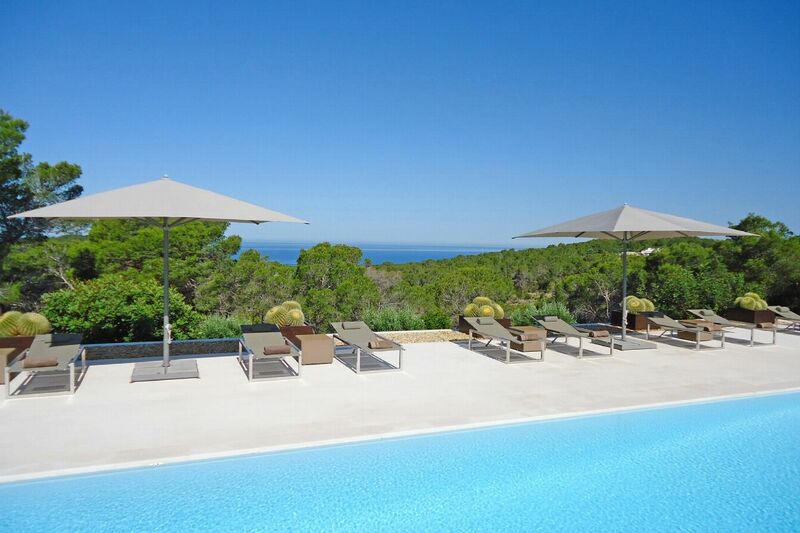 It is located high on a hillside above San Antonio with a fantastic view out to the Sâ€™Espartas islands. 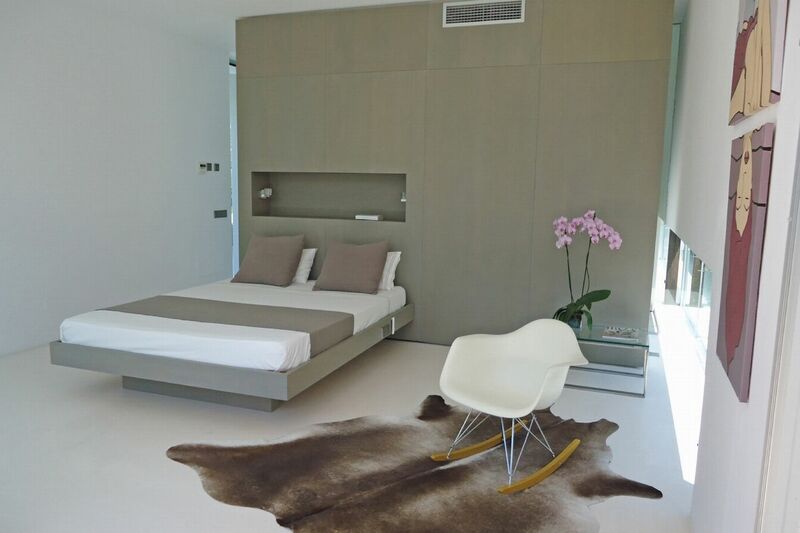 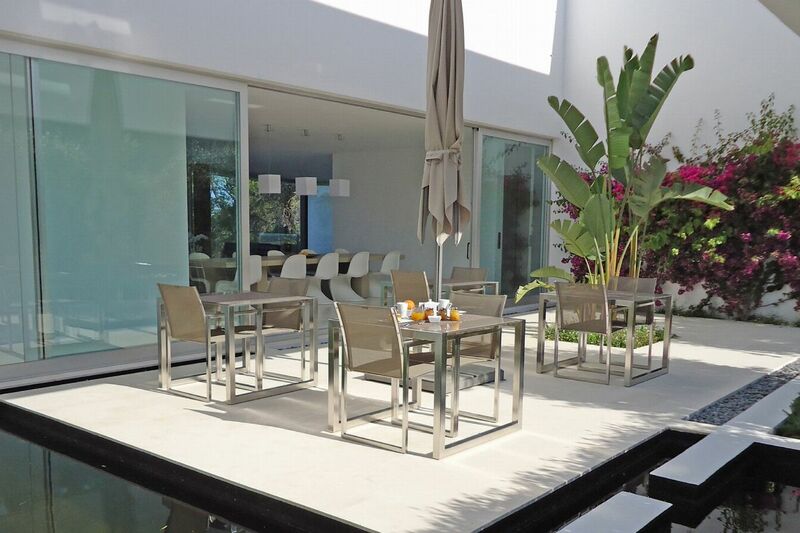 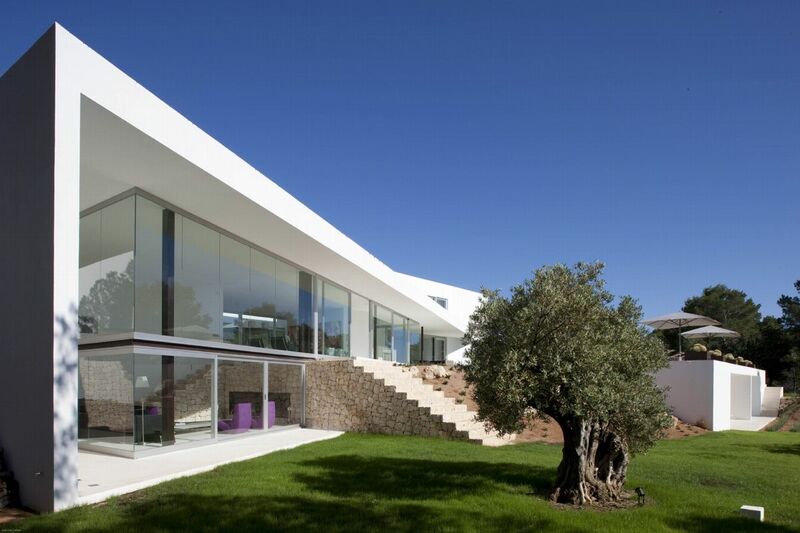 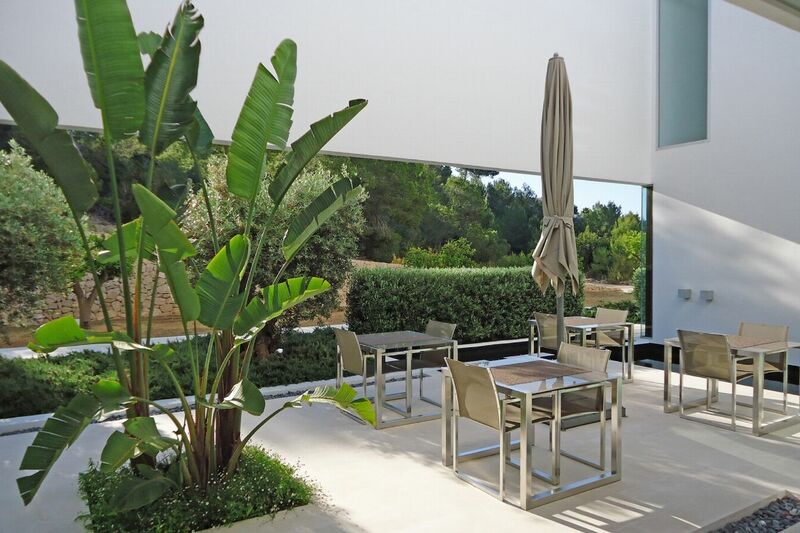 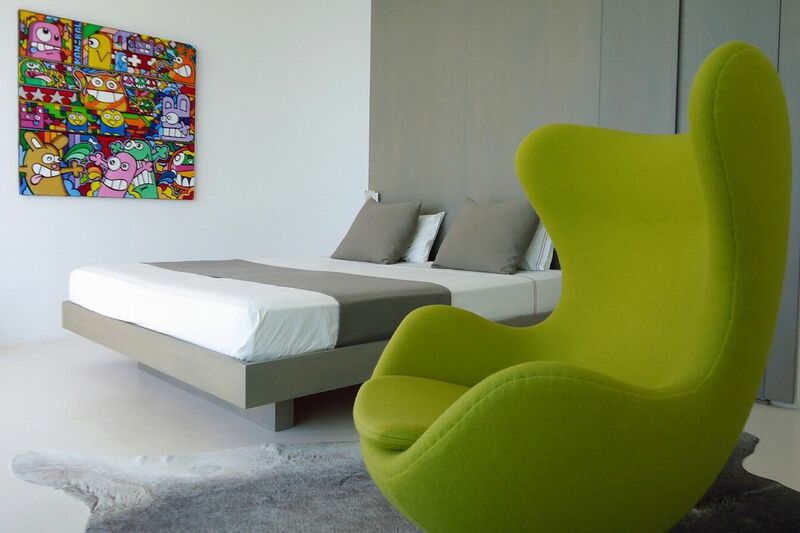 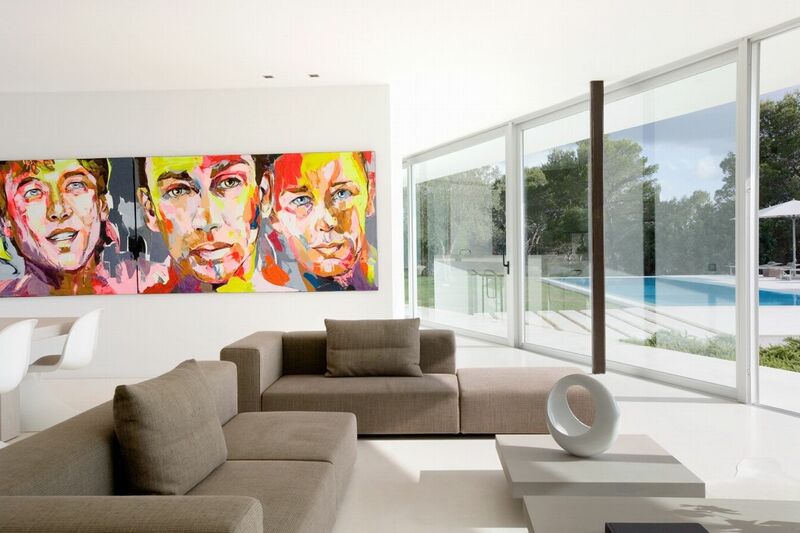 It is an outstanding contemporary property, beautifully designed with top quality finishes throughout, it is just a 20 minute drive from the airport, 15 minutes from Ibiza town centre and there is spacious parking for 8 cars. 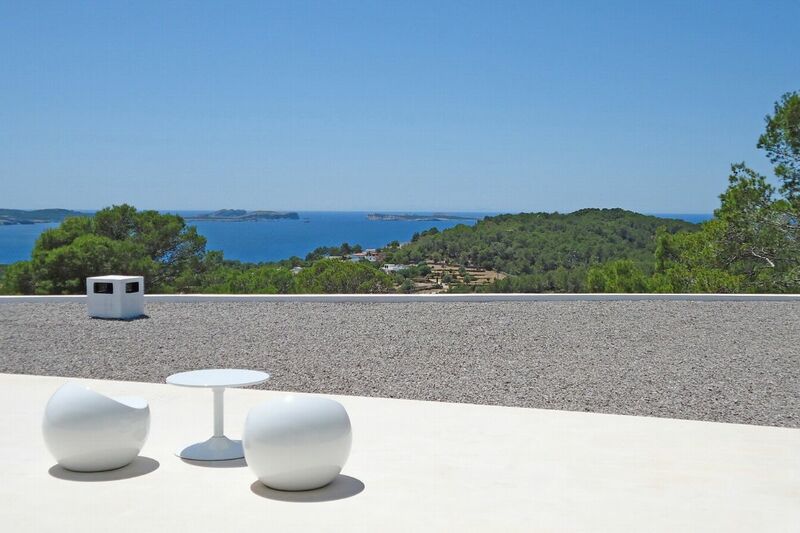 OUTDOOR AREAS The villa boasts impressive outdoor spaces with a unique open view of the town, bay and the magnificent sunsets. 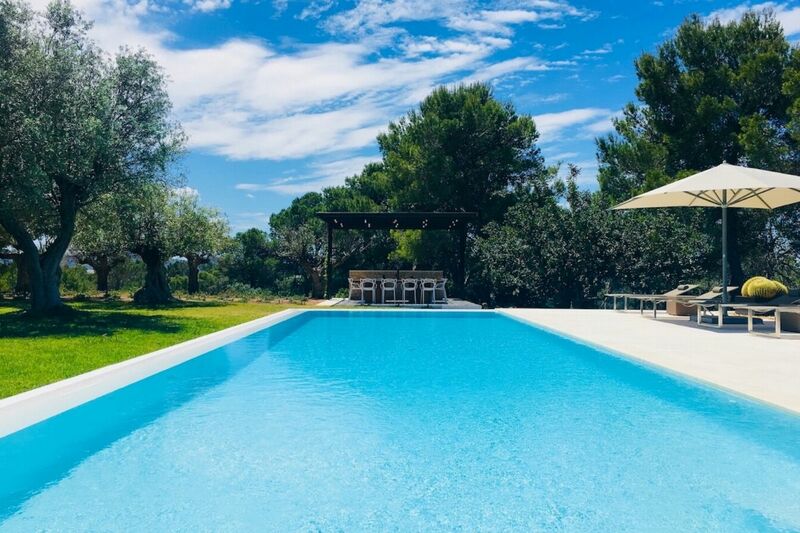 Thereâ€™s much opportunity to lounge and relax in the divine landscape garden fragranced with pine and citrus or sunbathe around the swimming pool of 17m x 5m. 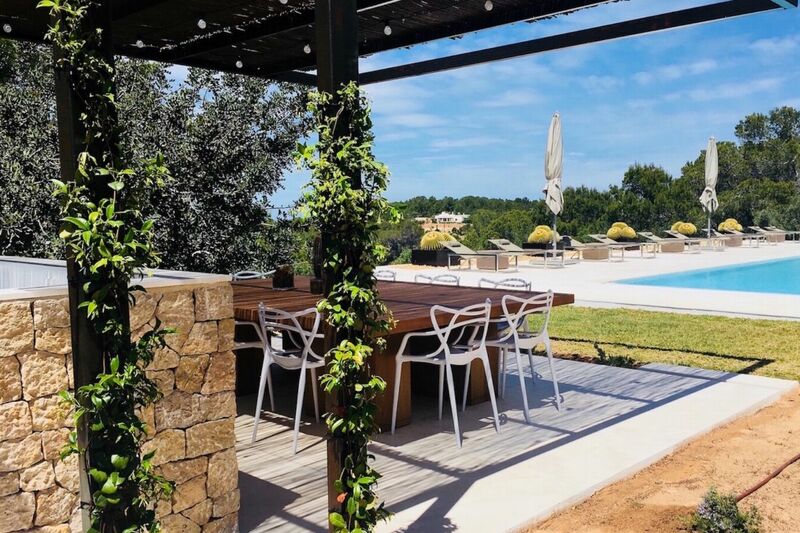 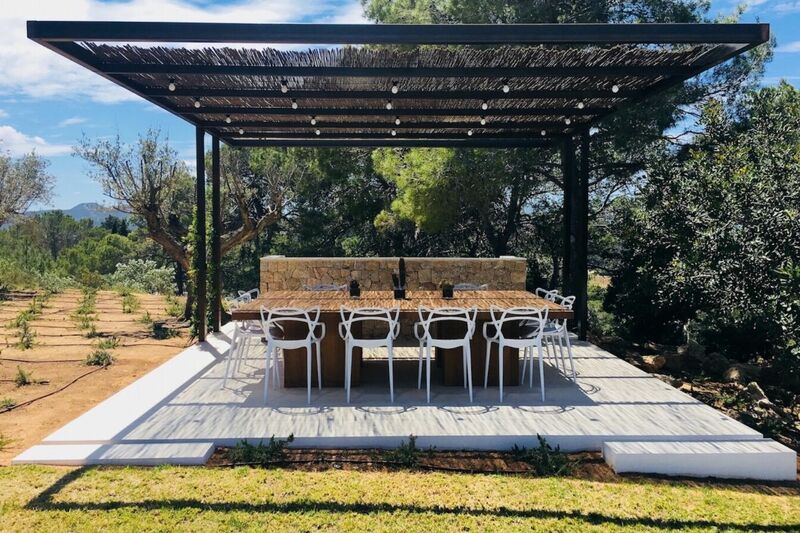 The huge sun terrace features a luxuriously comfortable chill out area overlooking the pool and views beyond; there is a brand new outdoor kitchen and dining area with a professional plancha, a professional barbecue and a large table of 3m x 2m seating 16 people. 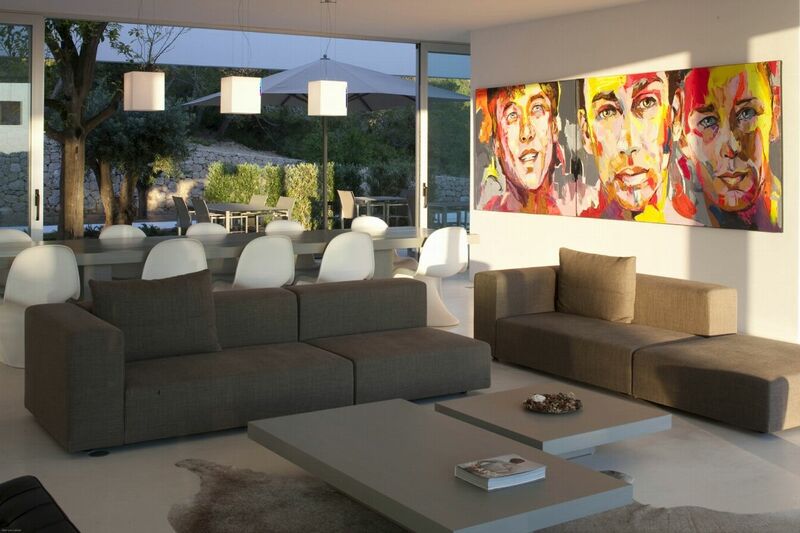 LIVING AREAS This is undoubtedly one of the finest properties the island has to offer. 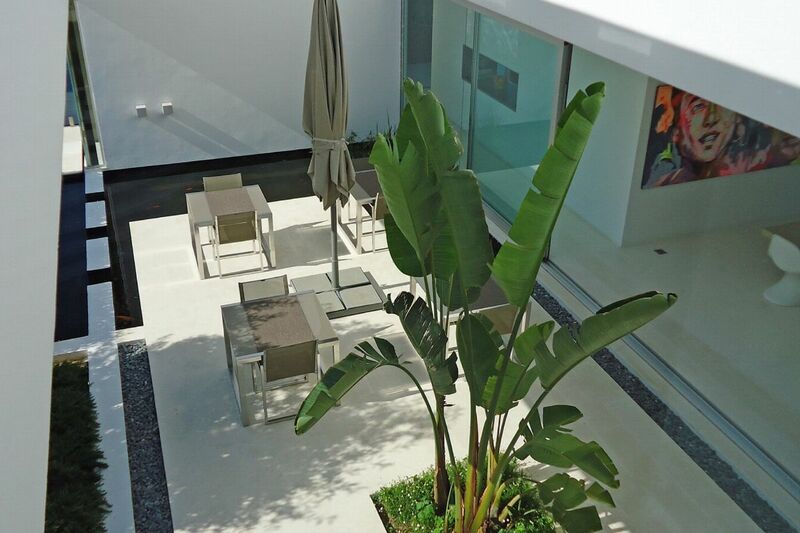 Designed and furnished to the highest specifications in a superb location, the interiors reflect the owners love for modern art and design. 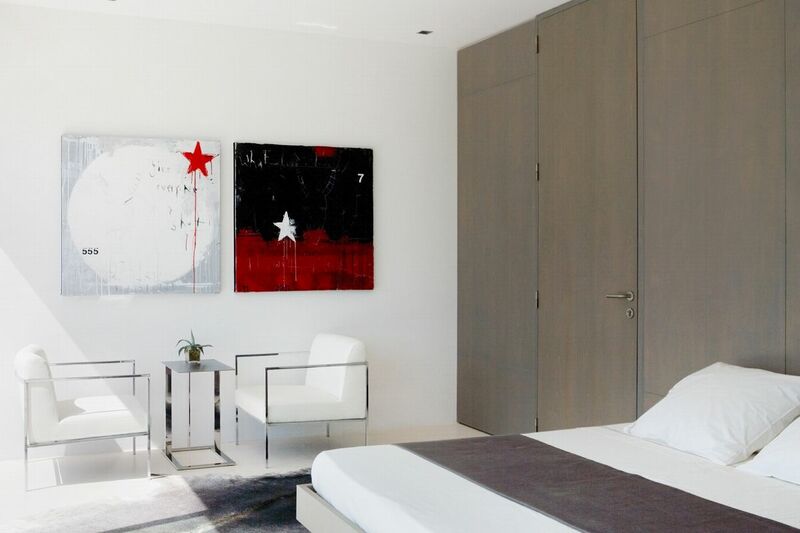 The interior design is minimalist and pays homage to some of the greatest names in design furniture and contemporary art. 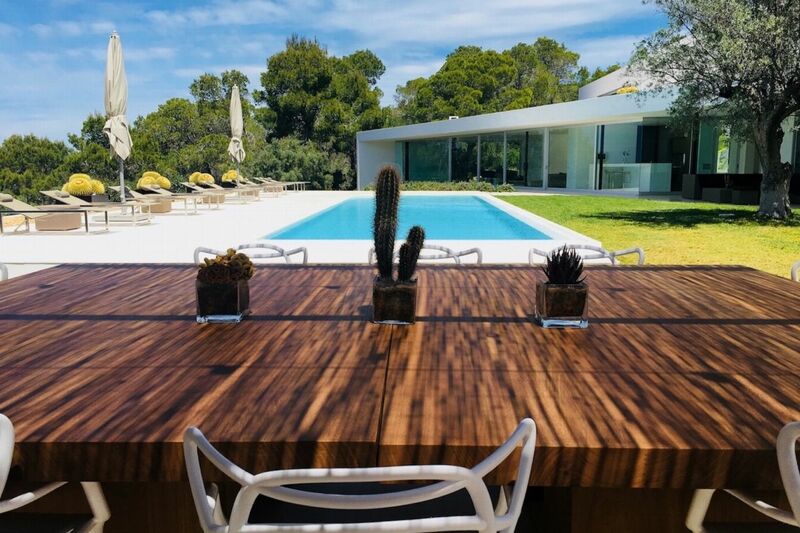 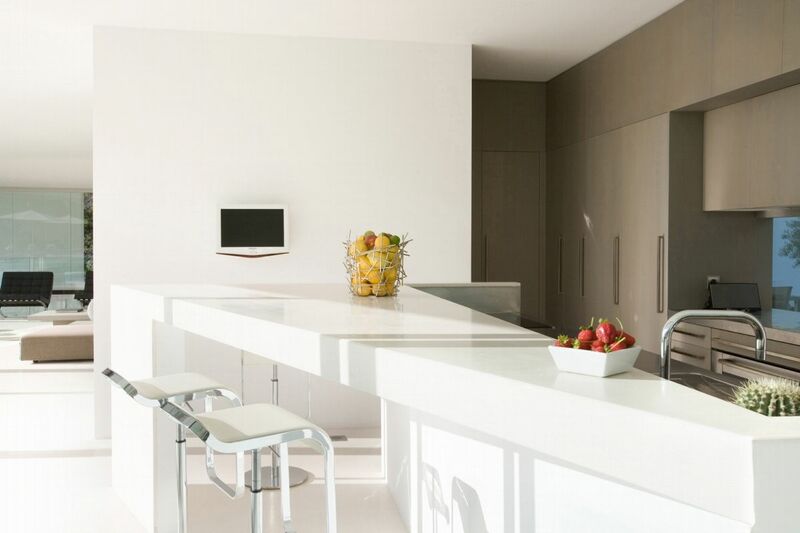 The modern kitchen is fully equipped and boasts a central island, there is a large dining room, a study area and a double height lounge area looking out over the pool and gardens. 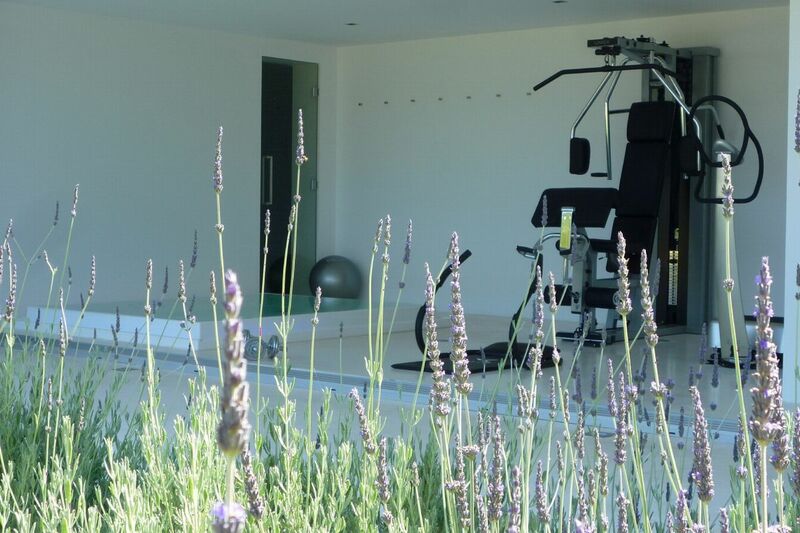 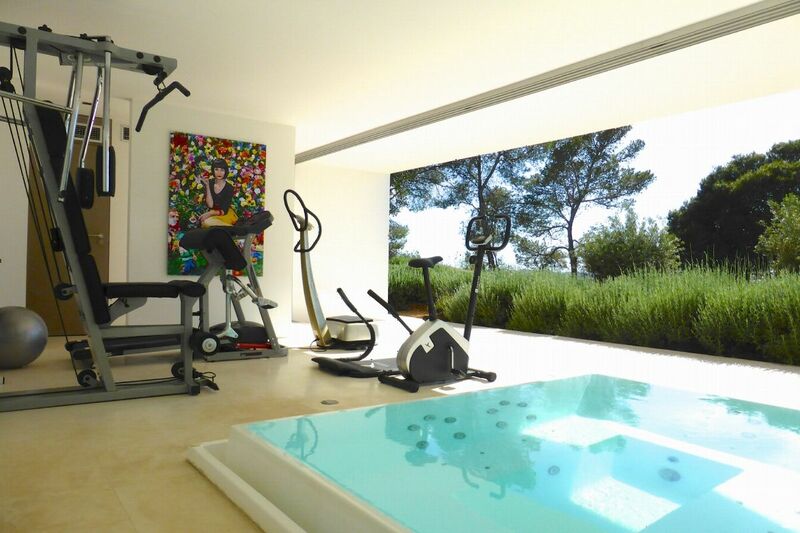 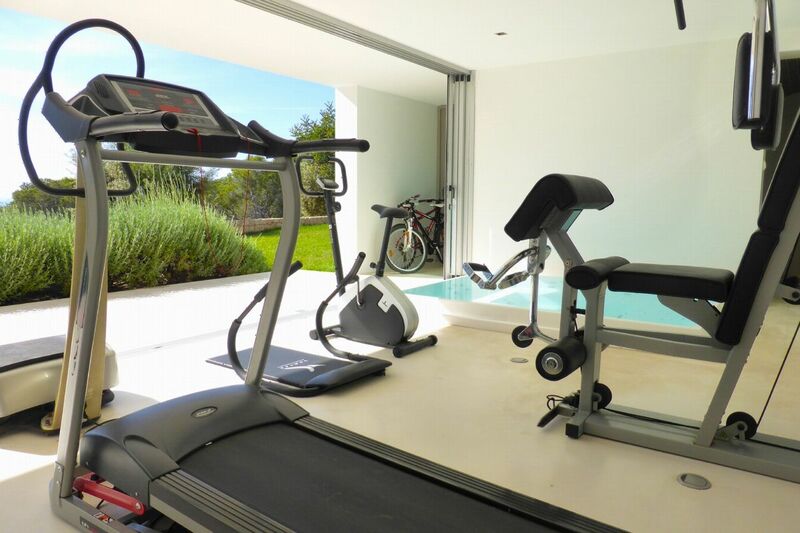 The fitness room overlooks the fabulous outdoor areas, it features a PowerPlate, Technogym UNICA equipment, a Jacuzzi for 6 people and Hammam steam room for 8 people. 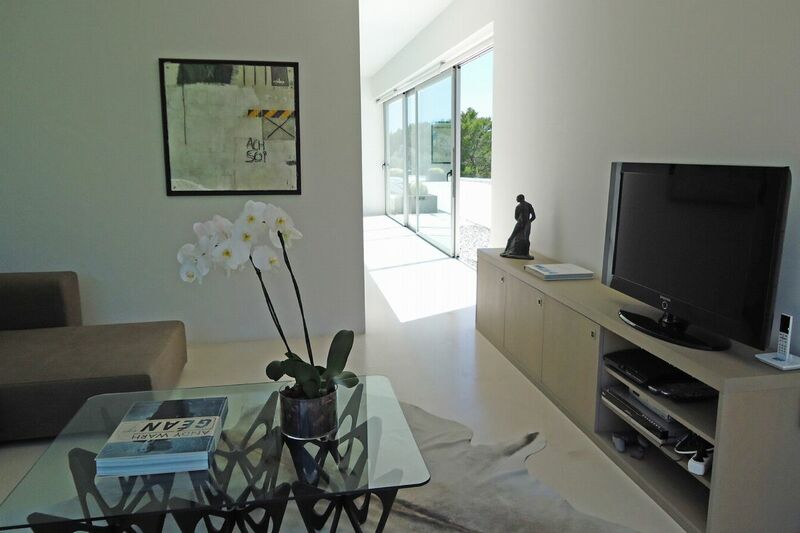 All areas of the house are air conditioned and have access to WiFi internet. 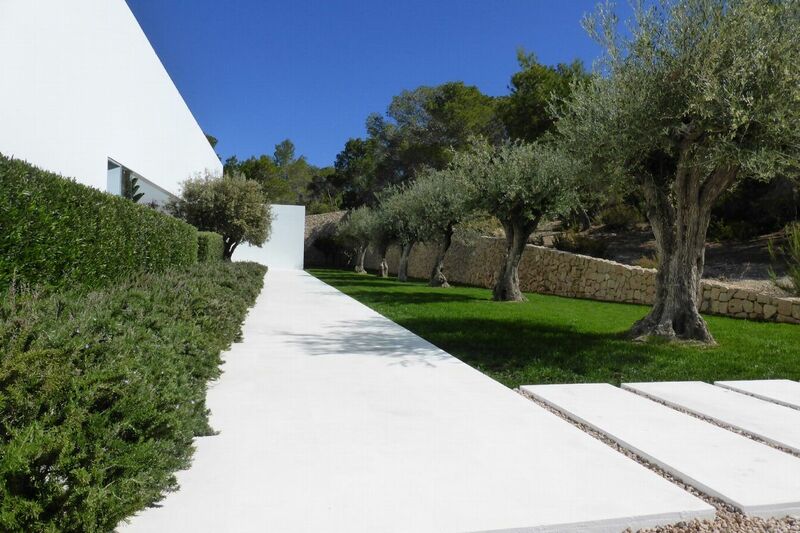 Ground Floor - (40m2) Double bed, en-suite bathroom, terrace, air conditioning. 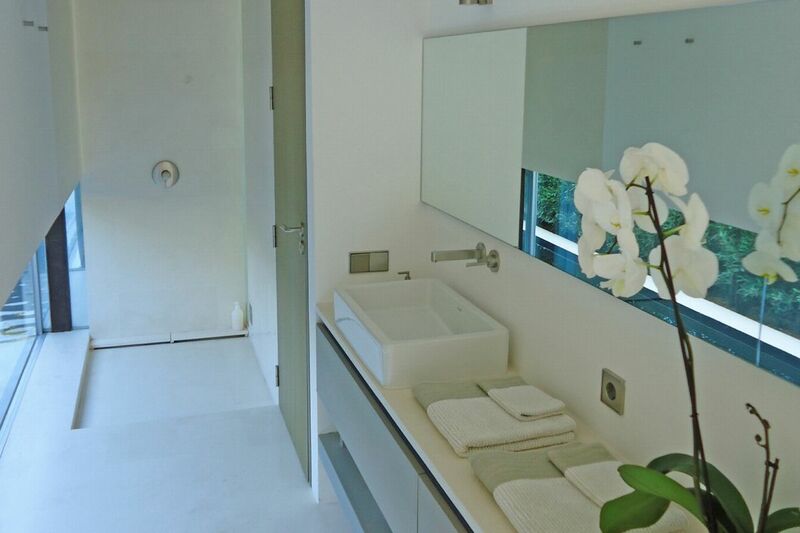 Ground Floor - (30m2) Double bed, en-suite bathroom, terrace, air conditioning. 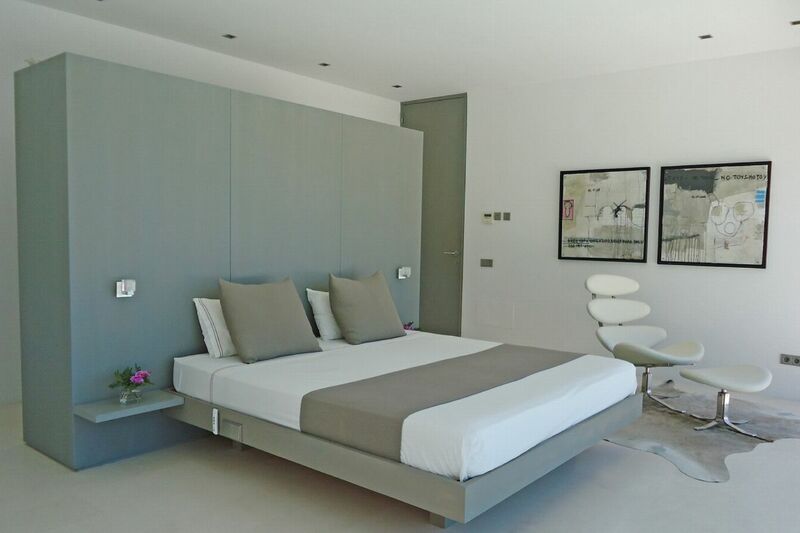 Ground Floor - (30m2) Twin beds, en-suite bathroom, air conditioning. 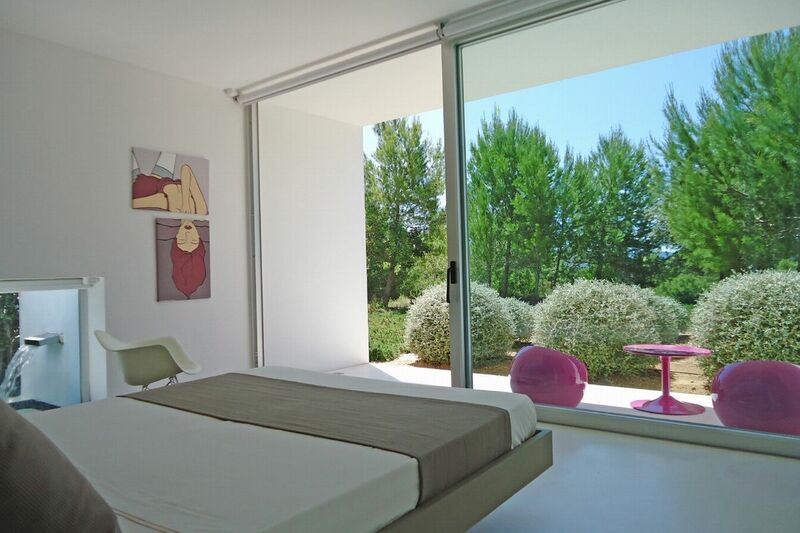 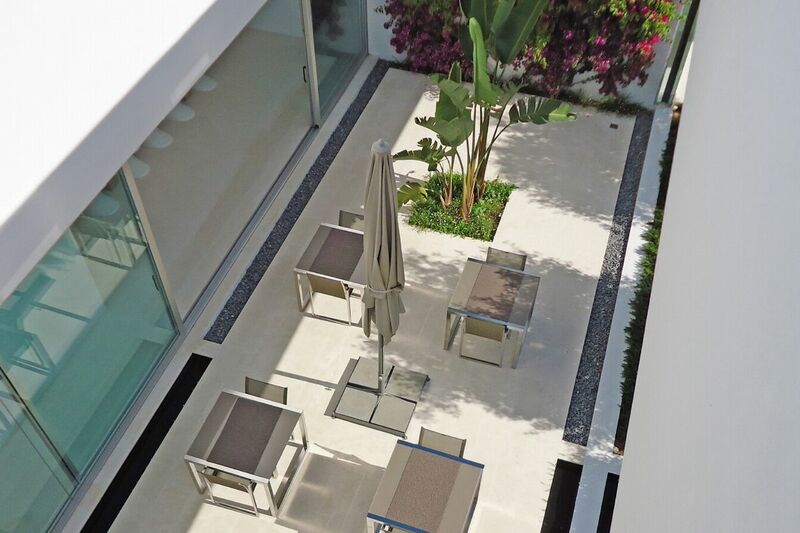 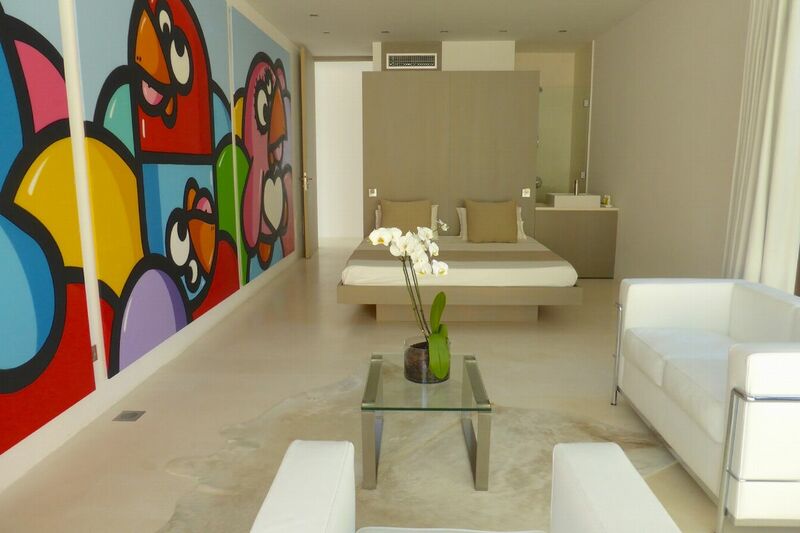 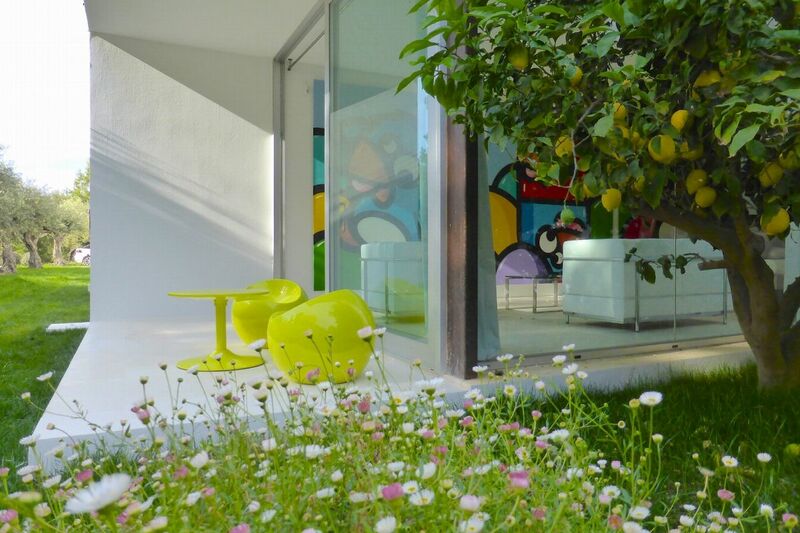 First Floor - (55m2) Double bed, en-suite bathroom, private terrace (120m2), air conditioning. 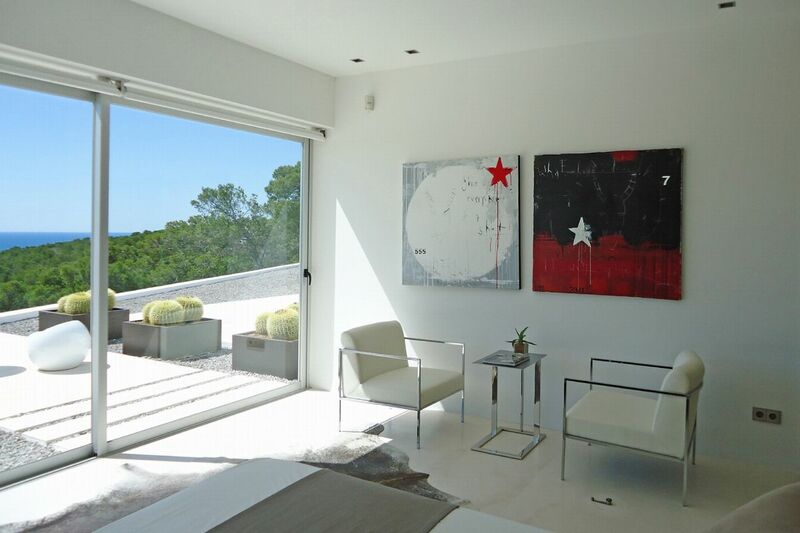 First Floor - (40m2) Double bed, en-suite bathroom, private terrace, air conditioning. 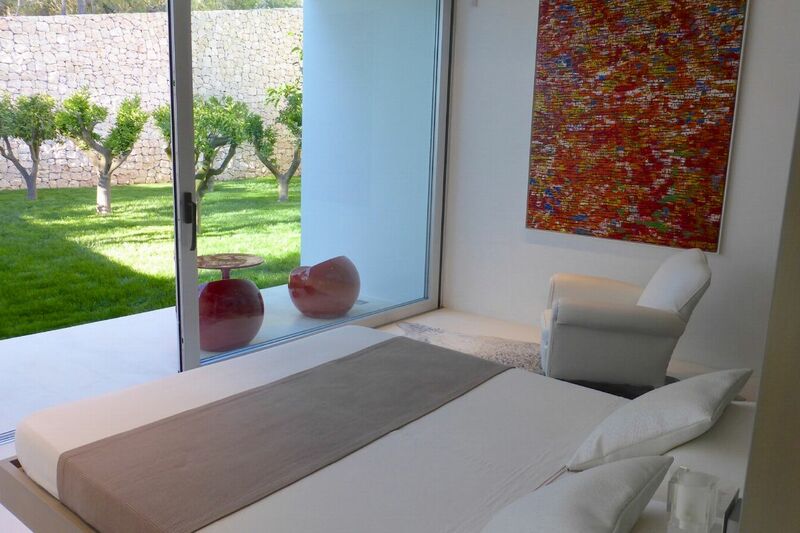 First Floor - (30m2) Double bed, en-suite bathroom, private terrace, air conditioning. 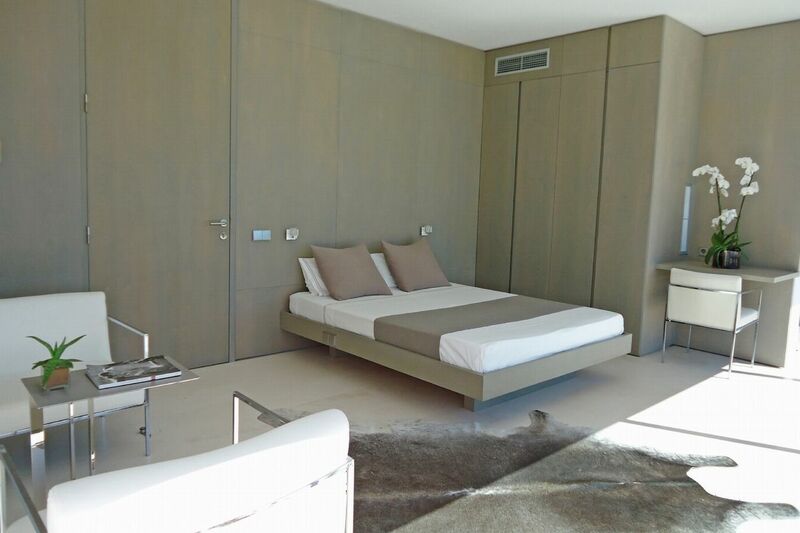 Service apartment with living room, kitchenette, bedroom and bathroom.